Yes, anyone can use Backstage to easily update a web site. Users feel right at home with familiar buttons and tools, step-by-step tutorials on Backstage features, and free support and upgrades with every subscription. Backstage is feature rich and comes with capabilities that empower every-day users to take control of their web site. Backstage is flexible enough to manage everything from a basic blog all the way up to a corporate web site. Forget lengthy manuals and annoying installation procedures, with your Backstage subscription you will enjoy the benefit of free live support, tutorials, and regular updates. Looking for a business opportunity? 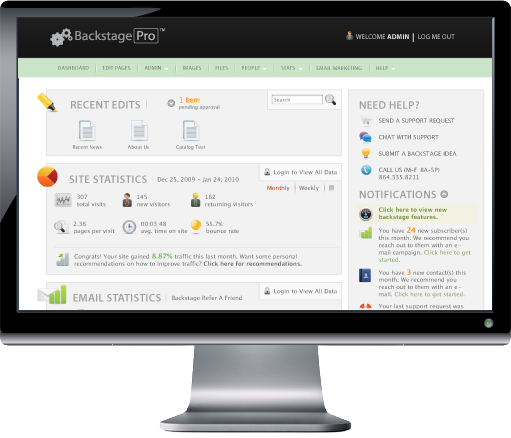 Provide your clients with a great CMS by becoming a reseller of Backstage. PRICING: Backstage fits in your budget. Get a specific and competitive quote by answering just a few questions.